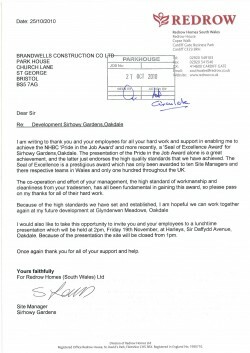 Brandwells has once again helped its clients in achieving NHBC Pride in the Job Awards for some of their site managers. We congratulate Syd James (Redrow Homes – Oakdale), Simon Foy (Linden Homes – SSGB), Chris Smith (Bovis Homes – Blackswarth Road) and three Barratt Bristol site managers, Alan Parrott (Fieldways – Paulton), Max Pitcher (Hortham Village) and Martin Link (Page Court) on their awards. We are proud to have been associated with these award winning developments.